The non-sticky water-resistant formula means your kids can carry on being kids while protected from the sun. I love this product because when my daughter applied it before going to the playground I was confident that she is protected and I love the price. Solartec fun in the sun! Justine’s suncare range, Solartec Skincare is said to prevent sun damage with UVA / UVB protection, repairs 50% of existing cell damage in just 24-hours and it protects against free radicals caused by the sun. 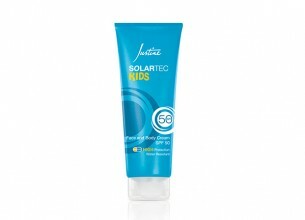 Solartec Kids Face and Body Cream SPF 50, has a protection factor that is very high, is water-resistant, oil-free and has a lovely, sweet scent. Solartec Kids Roller Ball for body SPF40 is ‘totally cool’, says my husband’s daughter!. The product is turquoise in colour, which helps to ensure that it spreads evenly. Luckily, the colour disappears when absorbed instantly into the skin and isn’t greasy at all. It also contains some goodness in the form of vitamins, aloe vera and chamomile. This one is ideal to keep in the netball tog bag for sunny sports days.